Staff members of the Economic and Financial Crimes Commission, EFCC continued their struggle for justice as they submit a second petition against their corrupt boss, Ibrahim Mustafa Magu to the President. The aggrieved workers have long exposed the crimes of Ibrahim Mustafa Magu to reporters from this newspaper. Their allegation were later confirmed in an indicting report written by the Department of State Services, DSS against Mr Magu. In a memo to Abubakar Malami, the Attorney- General of the Federation and Minister for Justice, Lawal M Daura, the Director General of the DSS said “Magu is a perennial offender and cannot change. If confirmed as EFCC Chairman, Mr Magu “will indulge in other unprofessional and criminal conducts for personal aggrandisement contrary to his oath of office,” the DSS report written by Alhaji Daura warned. Consequently, the Borno born corrupt officer has subjected staff members who blew the whistle on him to severe abuse at work. In response, Mr Magu, a level 14 Deputy Commissioner of Police claimed that the petition submitted to the Senate President, Bukola Saraki on November 6, was sponsored. In May, when this newspaper exclusively revealed the suspension of Nigeria’s Financial Intelligence Unit from a world financial server based in Toronto, Canada, Mr Magu said Adenike Lucas, the Editor of DENISAURUS News was sponsored. Mr Magu’s claim were later rubbished when the Egmont publicly confirmed the suspension three months after the expose. Core staff have gotten in touch with this newspaper again to inform reporters of the new petition that was submitted to the President on November 8. 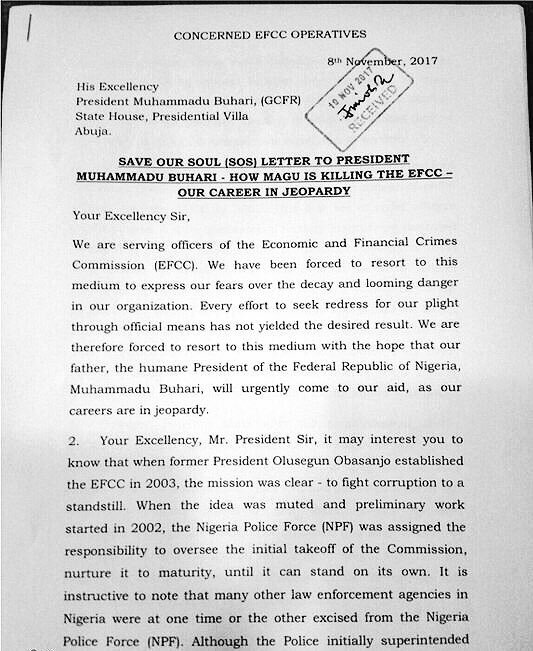 The Save Our SOS letter written by a concerned EFCC operative, calls on President Muhammadu Buhari to “urgently come to our aid, as our careers are in jepoardy. “We have been forced to resort to this medium to express our fears over the decay and looming danger in our organisation. Every effort to seek redress for our plight through official means has not yielded the desired result,” read the petition. The petition states that Mr Magu has an “outright hatred and disdain for us the civilian and indeed the real operatives of the Commission” and “has ensured that the Commission’s operations are dominated and managed by his boys from the Nigeria Police. 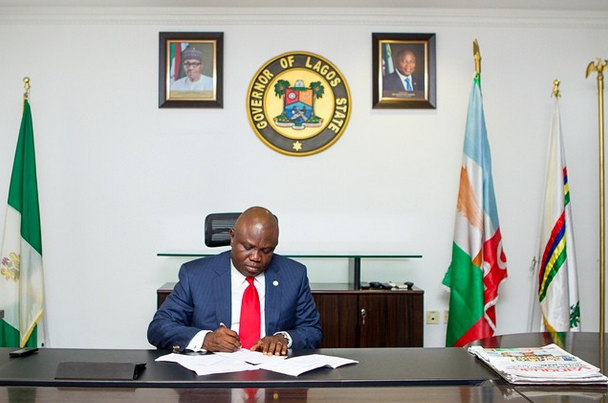 “To perpetually put down and frustrate us the core EFCC operatives, the Acting Chairman has stunted our growth in the system through lack of promotion.” For instance, the petition states that “Course I officers were last promoted in 2012. The concerned staff accused the Acting Chairman of running “media trials as a means of generating tension and drawing attention to himself as the’chief corruption fighter’ in the country, saying it is why there has been no conviction of any Politically Exposed Person during Mr Magu’s reign at the top of the anti-graft agency. The last part of the SOS letter begs President Buhari to act fast in order to prevent the Commission from sinking any further.